19 players, 3 water girls and 2 teachers did a great job at the football carnival. The team played in a round robin competition against EACS, John Paul College and Kalgoorlie Boulder. The girls won all of their games and then won the grand final against JPC 40 - 15. It has been many years since ESHS has beaten JPC! The whole team came together and played very well. 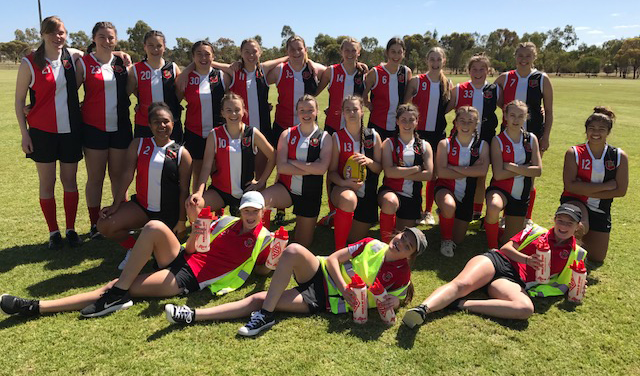 Taya Neill was a great centre half forward, Caitlin Zanker and Ruby Hodges were awesome rovers, Kalira Docherty was a great full forward and Casey Rowe, Lily Henning and Summer Newton performed strongly in the midfield.